Flame Lake Lodge is located close to Chapleau, Ontario. 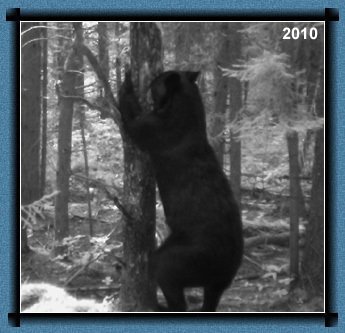 Chapleau is the called Black Bear Capital because we have the one of highest population of Black Bears in the world. We run a fairly small bear hunt each year, only taking a certain number of hunters to harvest a sustainable number of bears. This approach ensures our continued high success rate in our Bear Management Area. Ideally, each bait site is hunted only once each year. Baiting starts well before your hunt and we always offer a choice of active sites. There will only be one or two hunting groups (up to 6 hunters in each) in camp at the same time. Our success rate is consistently between 80 and 100%. 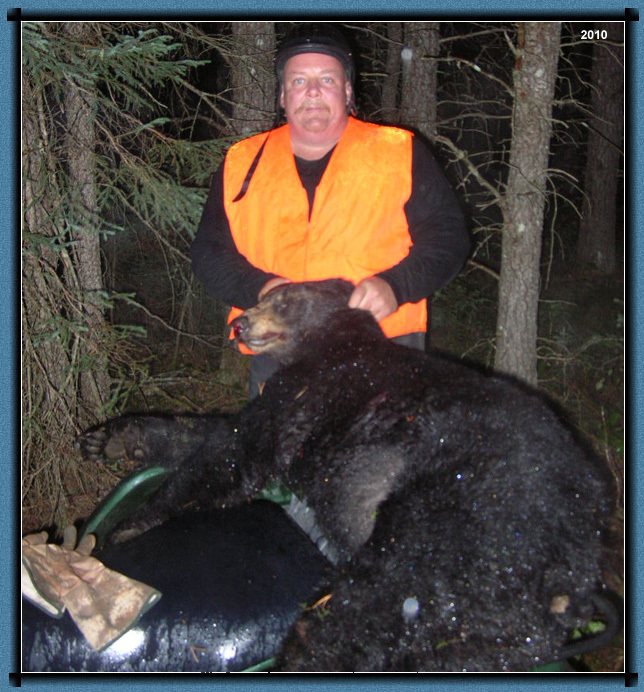 Almost all our hunters sight bears, but some simply choose not to shoot. If a site is being hit by a sow with cubs, we pull the bait and no one hunts there; although, we have had a hunter choose to sit for the whole week with no weapon, just to have to privilege of watching a sow with 3 cubs come in every day. This year, we are pleased to offer a new area, which has not been hunted for several years. Our hunting area is now 350 square kilometres. We are really excited about the potential of this new turf! Starting late August, all hunts run Saturday to Saturday and include h/k cabin or lodge accommodations (lodge includes meal plan), boat/motor, active sites, bait, guiding out on first day, bear retrieval assistance and refrigeration of meat and skins. We recommend you bring a 4-wheel-drive truck and/or ATV. Also bring your own blind and/or tree stand so you can place it exactly where you want it. Our sites cater to both rifle and bow hunters. All your licensing and paperwork is done here at the lodge for your convenience, including your export permit for the bear. You must bring a current or recently expired hunting license in order to validate an Ontario hunting license (Outdoors Card). If you already have an Outdoors Card for hunting, that is all the accreditation you need. Be sure to bring it with you. For more information on licensing, visit www.mnr.gov.on.ca and follow the links through Hunting Regulations, Outdoors Card and Hunting License Options for Non-Residents. 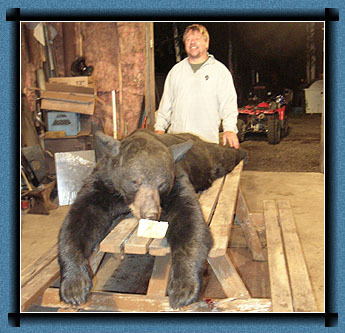 Your outfitter, Gary, is always honest and is here to help with anything you need during your hunt, including how to bring in that big, smarter-than-average bear. Gary always gives our customers 110% and will go out of his way to ensure you have a successful hunt and holiday. Please email or call for more information. 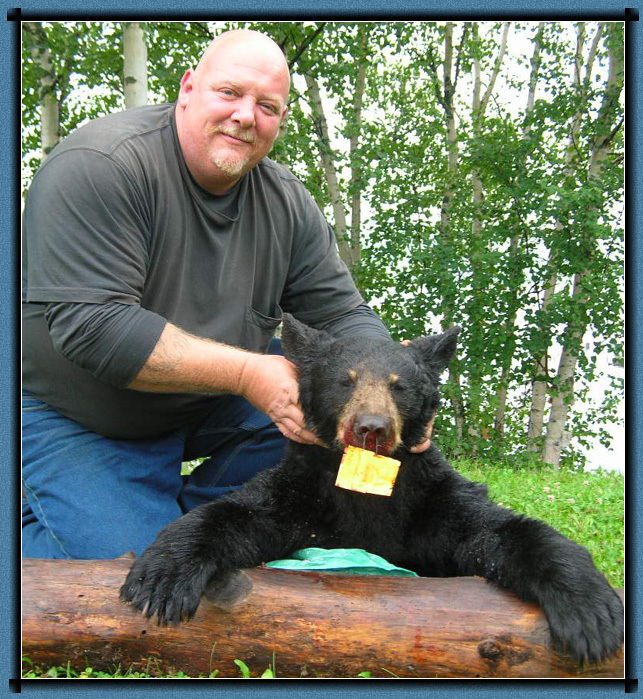 There is plenty to talk about when planning your bear hunt - an adventure of a lifetime.